Tuberculosis is the world's leading infectious disease and it accounts for one in three deaths from HIV/AIDS, according to the World Health Organization's 2018 report on TB. 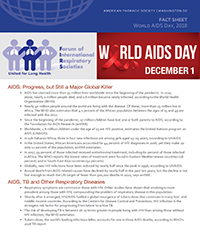 This is why on World AIDS Day the Forum of International Respiratory Societies (FIRS), of which the American Thoracic Society is a founding member, is calling on governments, health advocates and non-government organizations to strengthen their response to AIDS and TB. Read the press release.